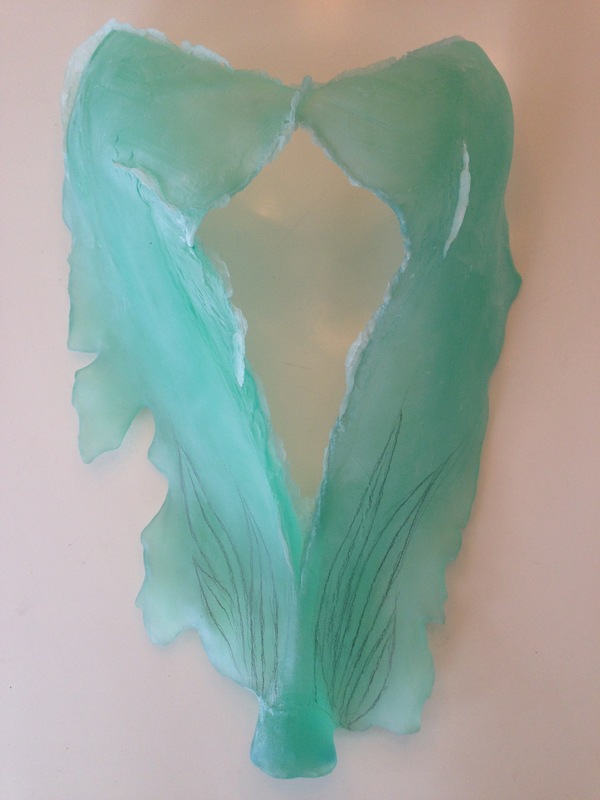 “Lagoon” began with a palm tree frond that I covered with wax to strengthen and preserve its beautiful, organic texture. Though not absolutely necessary, I added some venting wax around the outside of the form to insure against trapped air in the fairly thin piece. 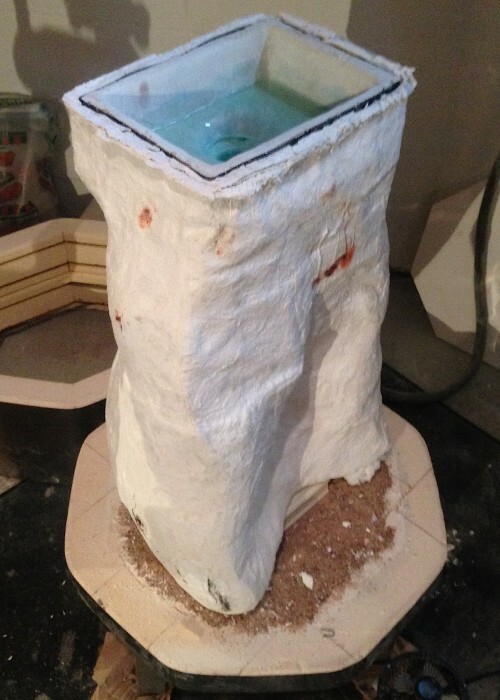 The model sits on a rectangular plaster reservoir that will funnel the melted crystal billets into the mold. 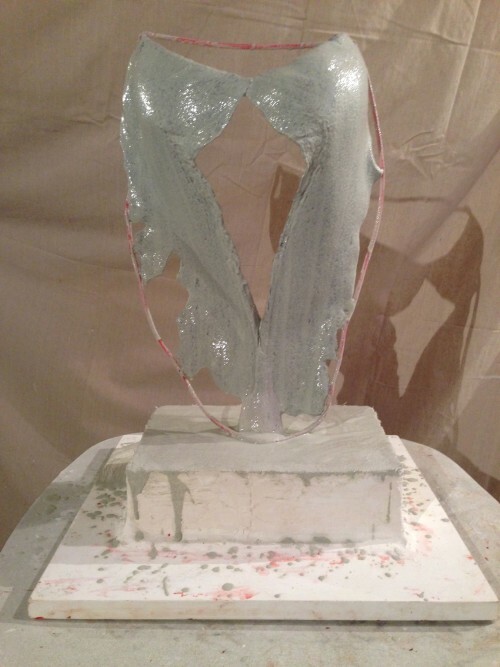 The first thin coats of high resolution, refractory plaster captures the finest details in the wax model. Notice the slight minty color that distinguishes this type of plaster (R & R 910) from subsequent layers of plaster. Many layers of strong yet porous plaster (R & R 965) are added next, until the mold is thick enough to withstand the pressure of red hot, flowing crystal. A cage of stainless steel screen, fiberglass mat and refractory cement (FGR 95) surrounds the heavily plastered form, which minimizes cracking during process. The wax model is steamed out once the plasters cure, leaving a negative void that will be filled with glass. 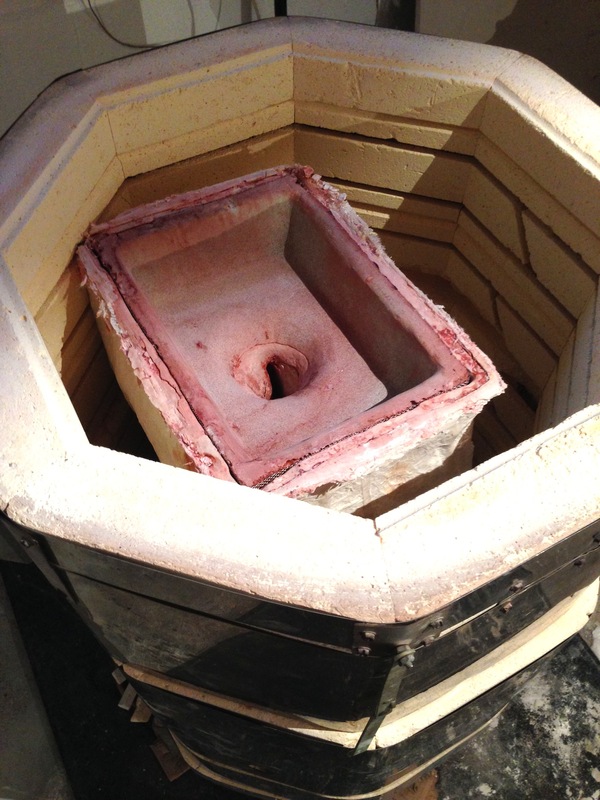 The inverted mold is set in the kiln to dry at low temperature for several days. Crystal billets are placed in the reservoir, which melt into the mold as it slowly rises to 1550 degrees. 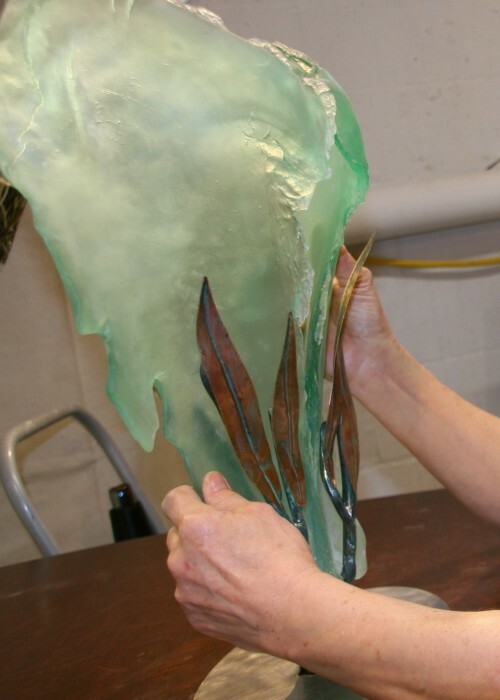 When the mold is filled with crystal, a weeklong cooling (annealing) cycle begins, removing any strain within the glass. 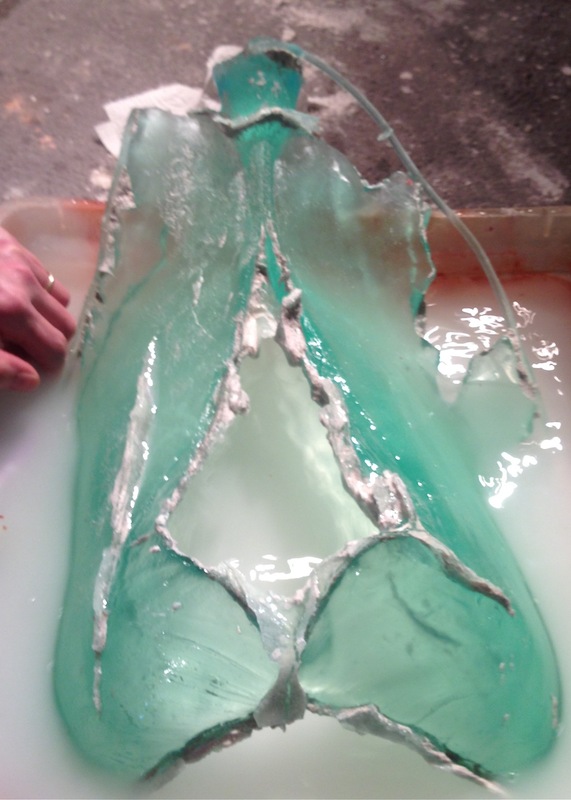 Only a thin coating of melted crystal remains in the reservoir, the rest now inside the mold. I was so anxious to get this piece going that I forgot to photograph the billets before closing the kiln. This was my third attempt at the form, so please forgive this oversight. Breaking the mold is an act of faith, every time. 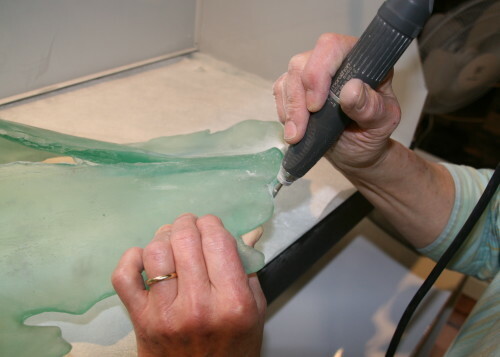 The strong plasters and stainless steel mesh soften when fired at such high temps for so long, but great care must still be taken when freeing the glass. I hold my breath with each new section that is revealed. 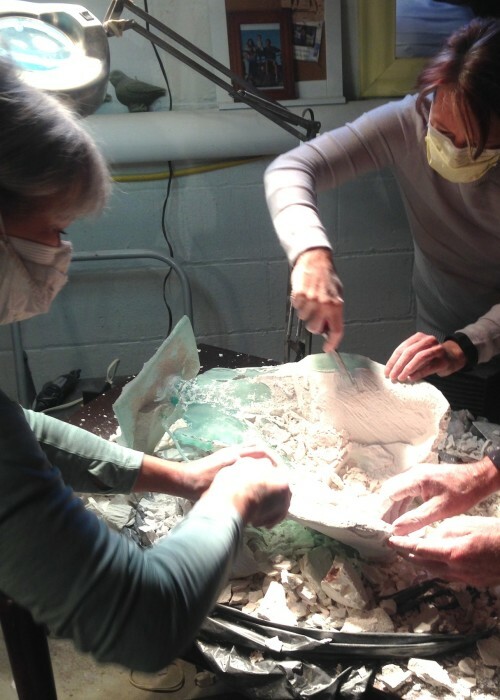 When most of the plaster has been removed, the glass is washed, ground and sanded to a soft matt finish. All of my work is hand rubbed with warm beeswax to enhance the luster and protect against fingerprints. Before the sprue (funnel) was removed, I sketched in a rough layout of my base design, directly onto the glass. 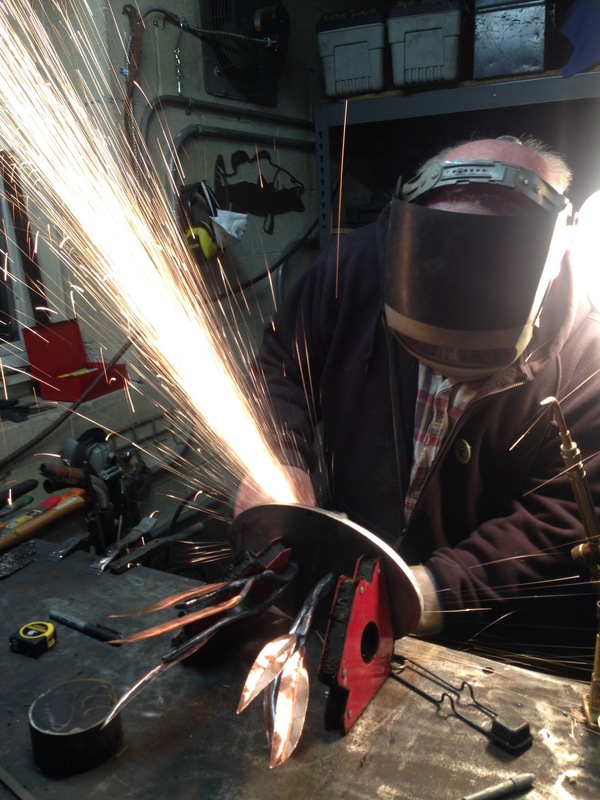 This helped my metal sculptor friend, Judd Nelson better understand my vision. 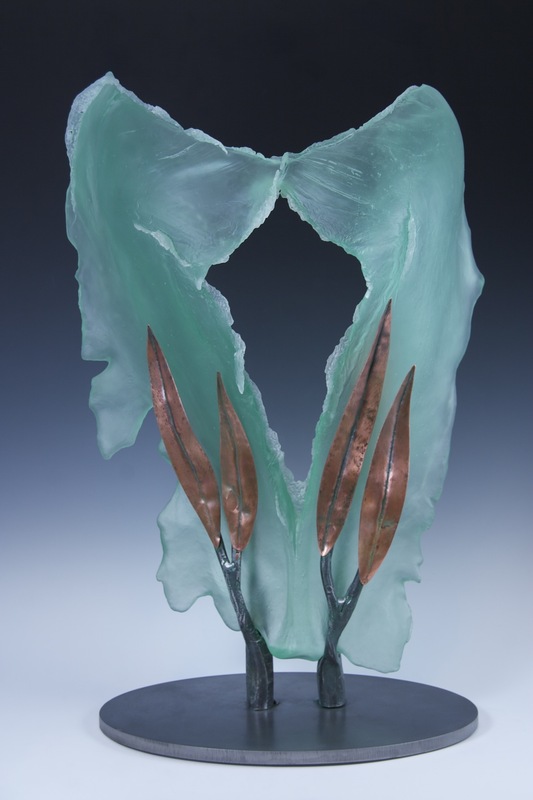 To begin the base, I hand cut individual copper leaves from thin sheet, then hammered in creases and shaped the curves. I haven’t worked with metal since college, so it was fun to play with it again. 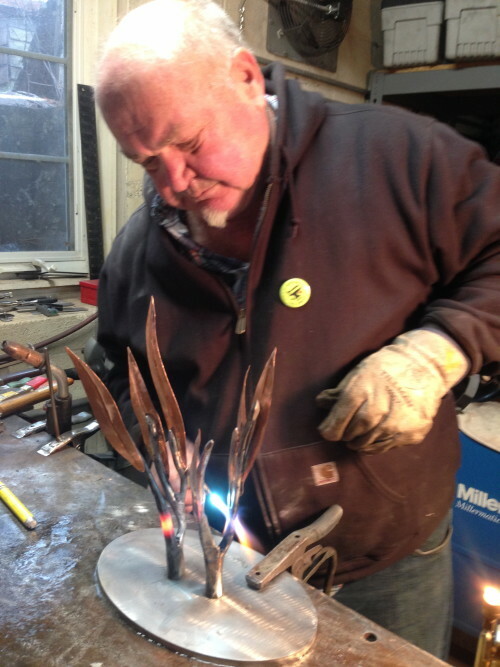 Judd split and forged the supportive steel branches, onto which he braised my copper leaves with great finesse. The assembled branches with attached leaves were welded to the oval steel base, then ground to finish in a spectacular display of sparks. 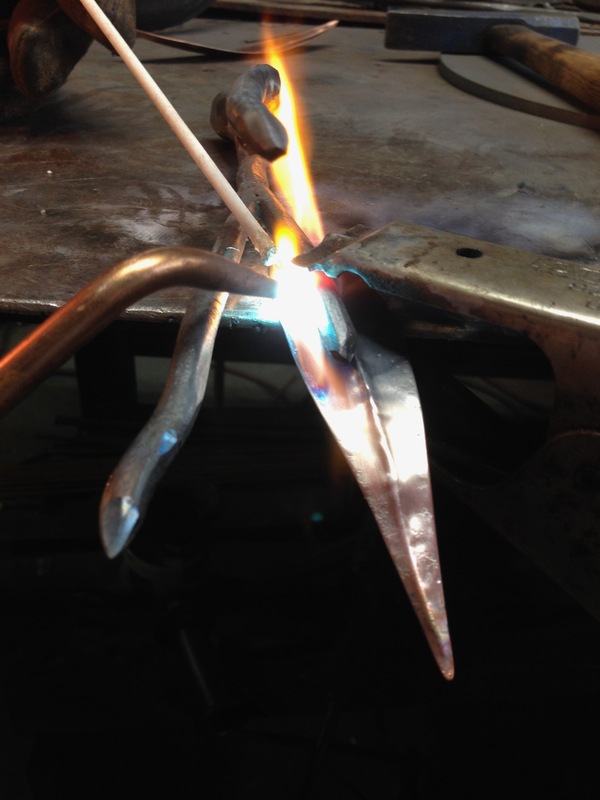 Together, Judd and I heated and bent the steel branches every which way to accommodate and balance the crystal form. After a few hours of tiny, edgy adjustments, Judd declared that it was my turn to grind the glass to fit the base instead of the other way around! I try not to argue with Judd, (because I need his expertise!) 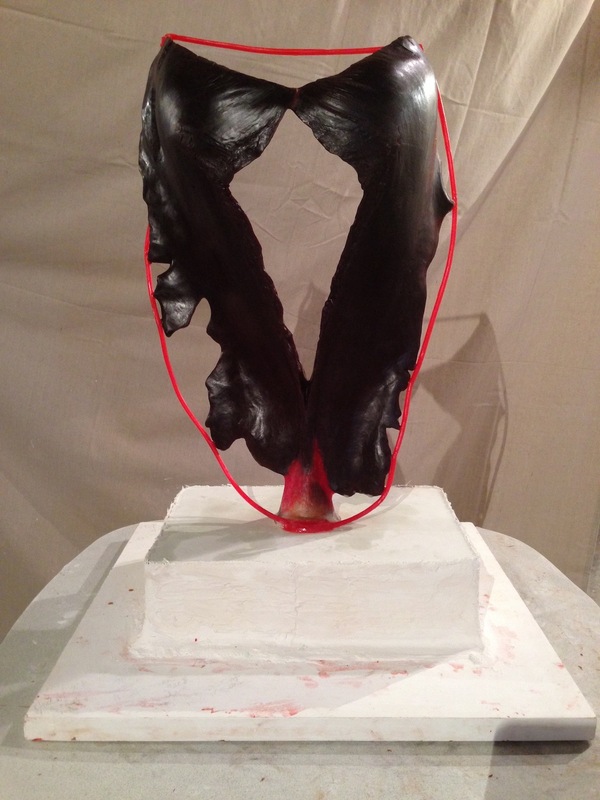 so I took the base and glass home to wrestle the piece into balanced submission, grinding in minute, incremental notches. Finally, a Verde green patina was applied to the entire surface of the base, to emphasize the variety of its metallic textures and unify it with the hue of the glass. Hi Donna; love these process pics. I do glass casting myself and have done so for about 6 years but I must admit I haven’t been as good as taking the process pics. I have used both wax and clay. I just got back from a month of casting education in the Czech Republic under the tutelage of Petr Stacho at the oldest glass school in the world. A completely different process that’s for sure and I felt very fortunate to learn their processes. Thanks for posting such a detailed process. 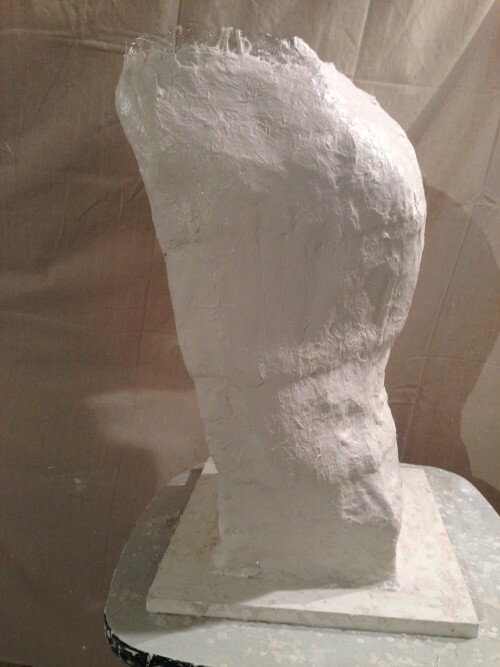 I am actually sharing it with Petr to show him detailed pics of other ways of casting in the US.